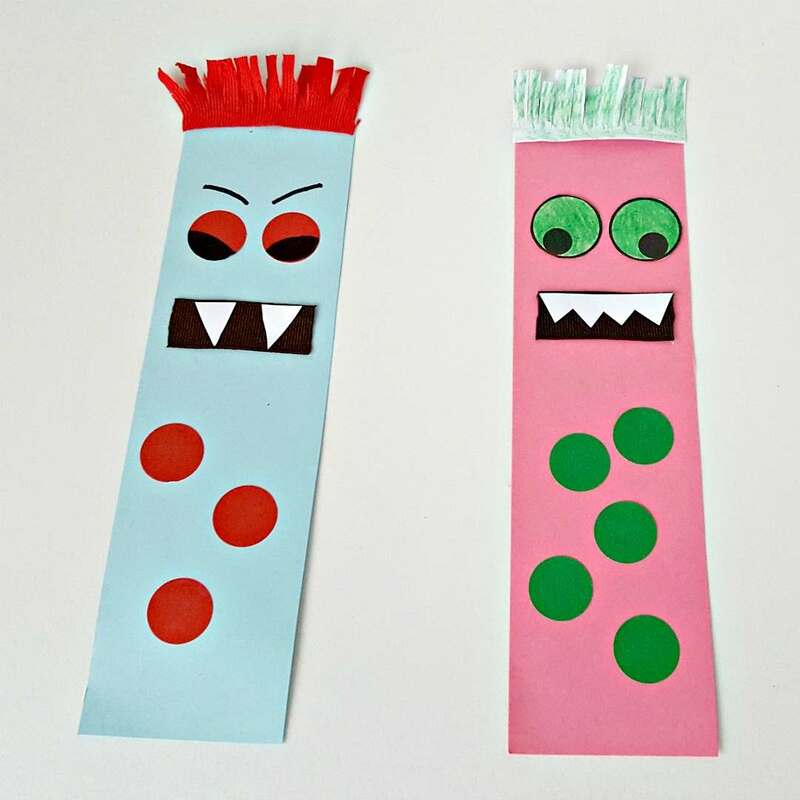 These monster bookmarks are so much fun to make and perfect for story time! I find that story time can be one of the most rewarding times of the day. It often involves snuggles and giggles and awesome adventures with dragons and dinosaurs! 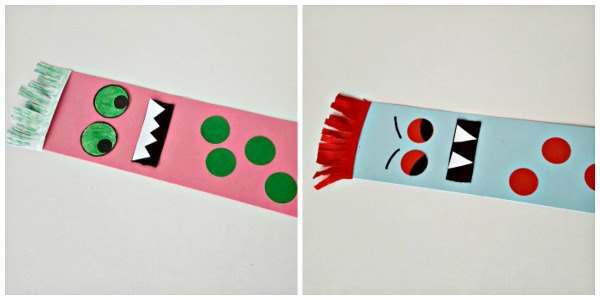 We love reading (we’re working our way through the 50 best books for toddlers) and decided to make handmade monster bookmarks! 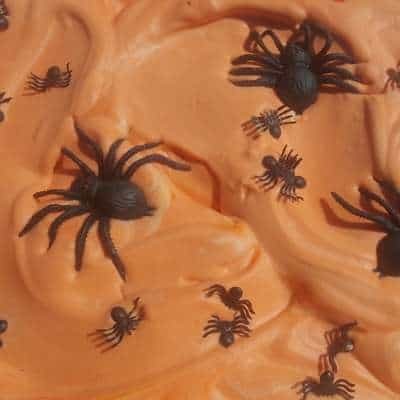 These are great for any time of the year, but even make a great Halloween craft too. These silly monsters won’t scare anyone away from reading books. 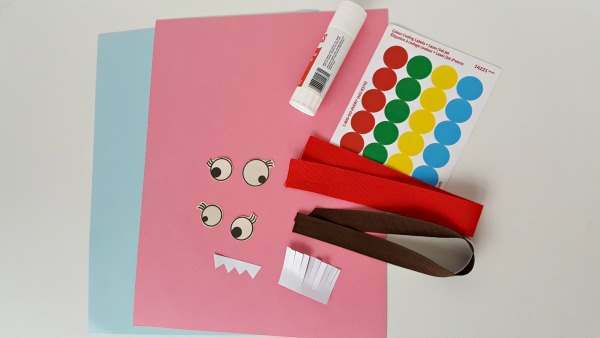 In fact, inserting a homemade bookmark into a favorite book will bring a feeling of fun and familiarity to reading time. There are lots of ways to make the bookmarks depending on the materials you use. 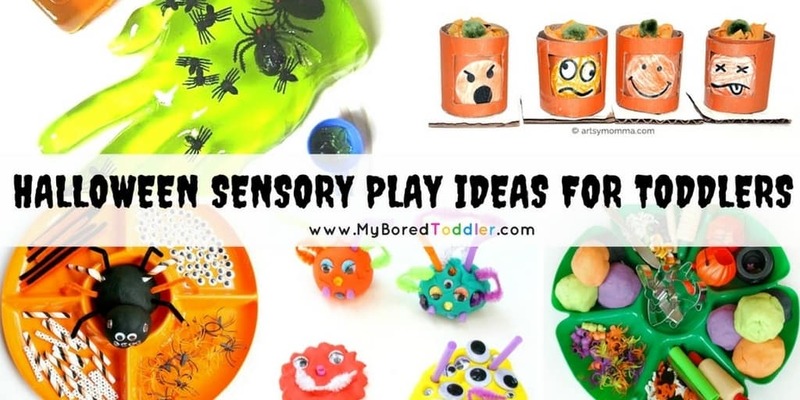 It’s a great time to go through your toddler craft box (see what I keep in mine here) before buying new supplies. Aren’t these ‘eyes’ amazing? We cut them from the pages of an old coloring book. They are perfect for this activity. If this isn’t an option for you, use these eyes as a guide to draw large googly eyes you can color and cut out together. The white paper cut outs are options for hair and teeth patterns for the monster. Cut the cardstock to 2.25 inches ( cm) x 8 inches ( cm) for the bookmark. If you find ‘eyes’ in a coloring book, it will probably be easier for kids to color the eyes before cutting them out. Draw a rectangle for your toddler to color for the hair. Cut out the rectangle and then cut slits to make wild, bushy hair. We used red ribbon for the hair, and red dots for the eyes. We colored narrowed pupils inside the eyes with black marker and slanted eyebrows for a grouchier look! A piece of wide dark ribbon under the teeth forms a mouth and helps the sharp white teeth stand out! Self-adhesive dots or other shapes are perfect for decorating the bookmark. 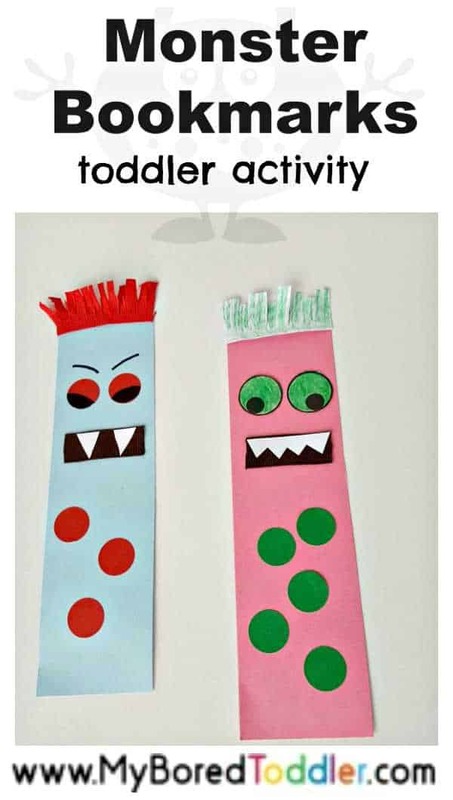 A bookmark is a fun and easy craft for toddlers, and one that has the added benefit of promoting a love of books.Making monster bookmarks is one way kids can laugh and learn with growls and giggles. Take turns with your toddler making facial expressions to portray emotions.Then choose a favorite book for your bookmark so you’ll be ready for story time! Don’t forget to check out our 50 Best Books for Toddlers too!